I three together this dish in all of 10 minutes, it's that quick. We actually served with with adorable miniature vegetable spring rolls because isn't everything miniature adorable? Well, most things, especially foods though. I personally am always thrilled to find vegetable spring rolls, as in, without chicken or pork, because really people? there are people who don't want chicken or pork. I will say that this dish may be a bit high in sodium but that's attributed to the soy sauce and I sort of cheated and used a can of stir-fry vegetables from the Asian section of the grocery store. I'm sure if you were feeling it then you could get wild and add in the carrots, bean sprouts, water chestnuts, bamboo shoots, red peppers, and mini corn individually but those cans of the individual ingredients are HUGE! You could also get away with rinsing the stir fry vegetables out of the can because you're adding a sauce anyway. Wish I would have thought of that when I made this...I loved it though. I used a spicy soy sauce so I didn't add any additional spice but feel free to toss in some crushed red pepper or sriracha sauce if you would like to. Now, the tofu shirataki noodles...they can be a little scary but in the right application they are awesome. I will warn you, there is a smell when you open the package that on the package they call the "authentic aroma", nice yes? So, it just smells fermented but if you rinse the noodles under water then toss them in the microwave for 1 minute I absolutely promise you won't have that smell or some crazy taste. It says to microwave them on the package, please do it. You can also boil them but I'm lazy so I microwave them. Don't bother drying them though after microwaving because you're tossing them into a saucepan with sauce and veggies anyway, see? no point. So, now that I've talked your ear off, let me know what you think about the recipe or if you've had the noodles before and your feelings on those! 1. Follow package directions for tofu shirataki noodles, but don’t bother drying them after precooking them. Set aside. 2. 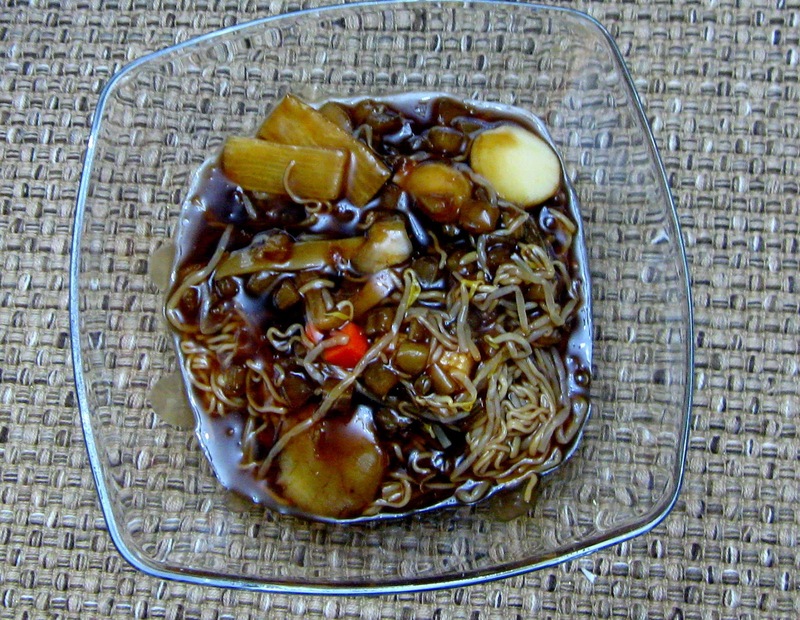 In a saucepan over medium-high heat stir together the hoisin sauce, soy sauce, and water. When the mixture is warm then whisk in the cornstarch and cook until thickened, 2-4 minutes, stirring occasionally. 3. When the mixture is thickened, add in the vegetables and cook until warmed through, 3-4 minutes, stirring occasionally. Add the tofu shirataki noodles and heat until warmed through. Been patiently checking in everyday and am finally rewarded with .... tofu? Really? Not nutella filled crapes, but tofu? Your comment made me laugh for more than 10 minutes on and off, just so you know. I will do better the rest of the week. Maybe next week I will skip Meatless Monday, just for you :).